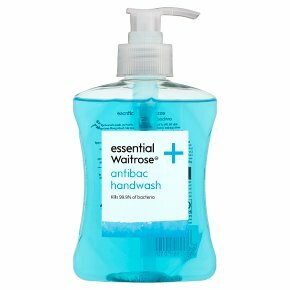 This antibacterial handwash will help you to keep hands hygienic, while taking care of your skin. As well as being effective at removing stubborn germs and smells, the wash is pH balanced and moisturising, to leave hands feeling soft and smooth. This pump-action bottle contains 250ml of handwash and is part of the essential Waitrose range. Aqua, Sodium Laureth Sulfate, Sodium Chloride, Cocamidopropyl Betaine, Salicylic Acid, Propylene Glycol, Parfum, Disodium EDTA, Trisodium Sulfosuccinate, Benzophenone-3, Magnesium Nitrate, Polyquaternium-7, Hexyl Cinnamal, Hydroxyisohexyl 3-Cyclohexene Carboxaldehyde, Methylchloroisothiazolinone, Magnesium Chloride, Sodium Benzoate, Methylisothiazolinone, Sodium Hydroxide, Lactic Acid, Hexylene Glycol, CI 42051.